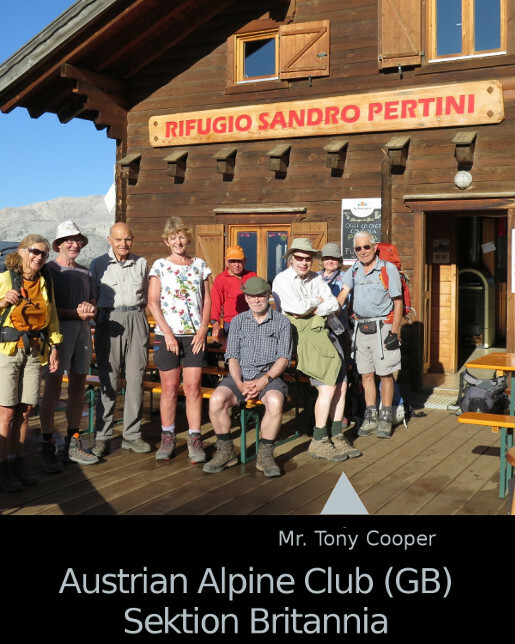 On the 24th of October Mr. Tony Cooper, a British committee member gave a talk about the British Section of The Austrian Alpine Club, the AAC UK or Sektion Britannia. It is one of only 2 foreign sections, the other one being the Sektion Flandern. The AAC UK was founded in 1948 by Walter Ingham and has now more than 14.000 members in the UK and overseas. Since the beginnings in 1950, when Ingham launched his first post-war ski-parties to the Tyrol and organized the first snow trains to the Alps, multitudes of UK members have come to Austria for alpine activities. An annual membership fee of about fifty pounds includes a worldwide Mountain Rescue Insurance, discount accommodation costs in alpine huts, maps and a quarterly newsletter. Tony circulated some copies of the newsletter and they are most interesting, with many beautiful photos, excellent articles and lists of Alpine and UK Training Courses for ordinary members and tour leaders. Courses, most of which are in Austria, include Ski Training, Snowshoe Training, Alpine Skills and Rock Climbing. The newsletters also list many activities such as walks, tours, lectures and meetings in the UK. Tony also told us that the ACC UK is wealthy as it has so many members, which was rather surprising. We all enjoyed a very animated and interesting evening.